If you haven't had the opportunity to check out the Mega Man original video animation series “Upon a Star,” you’re in luck. All three episodes of the show have made the jump to the digital market place via Amazon Video for a mere $1.99 a piece. Purchasing any episode warrants the ability to stream it directly to your browser, television, or a variety of mobile devices. In total, all three episodes will run you $5.97 -- far cheaper than purchasing the $21.76 DVD version. 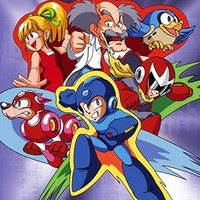 Upon A Star was the first fully animated Mega Man series, preceding the ever popular Saturday morning Ruby-Spears cartoon. Despite being touted as being a tool to educate children on Japanese culture, the show boasts some pretty snazzy visuals and animation that any classic series fan can appreciate. UaS is also available for digital download from iTunes and Netflix Instant. It so awesome that its on Netflix. I was sitting with my girl looking for something to watch so I typed in megaman expecting to find nothing, but then I found this. Needless to say, we watched us some Rockman that night. Quite a deal. I'm not sure how they secured the rights from the now defunct ADV, but this is a lot better than paying collector's prices for the DVD on eBay.